Source: Netgalley/Point Books – I received this book in exchange for an honest review. I received no compensation. 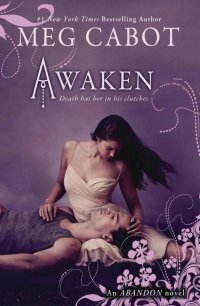 Awaken is the final book in the Abandon trilogy and it’s the best in the series. I have loved Meg Cabot since her Princess Diaries days and her Mediator Series was my favorite series growing up. Who doesn’t love a cute ghost! Anyways, this series has not been my favorite compared to others but I am her fan and I stuck through to the end. Let me just say it was well worth it. The first two books carried some plot holes that made the story mediocre but apparently she saved the best for last. The final story follows John and Pierce and their final clash with the furies.Trudging through all her trials Pierce is the real heroine of the story. She has been through quite a bit but continues to do what is right even though it may cost a loved one's life. The romance between John and Pierce mirrors a real relationship. It isn't all lovey dovey without problems, they have to work hard for their relationship. This is nice to see in comparison to romance you find in some YA novels. My overall rating is 3.5/5. Compared to some of the other Persephone-Hades retelling stories, this one was mediocre. It contains all the right elements to make one awesome YA book, it just fell short. Thanks for the honest review. I have enjoyed this series so far but I haven't been in love with it. I'm glad to hear that the final book is the best so far. I plan to read it very soon!